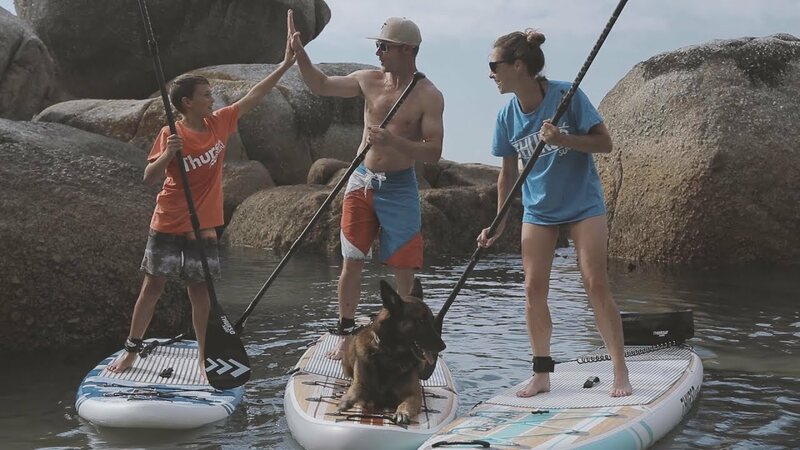 The THURSO SURF Waterwalker Inflatable Stand Up Paddle Board is an All-Around paddle board for all paddlers, skill levels, and water conditions. By uniquely incorporating a touring shape to the traditional all-around contour, the Waterwalker offers the best of both worlds: it is extremely stable and forgiving in most water conditions, and it can travel effortlessly for long distance paddling trips. THURSO SURF Waterwalker is a great All-Around inflatable board made for all paddlers. It is the first to combine design elements of both a traditional all-around board and a touring board, maintaining the best characteristics of each. The result – excellent stability and great tracking. The Waterwalker is both beginner-friendly and fun for intermediate/advanced paddlers. The THURSO SURF inflatable SUP boasts the strongest iSUP structure on the market, featuring DOUBLE LAYER construction with TRIPLE/QUAD Military Grade PVC coatings on the deck and side. On the deck a TWO-layer PVC coated tarpaulin is bonded to a PVC coated drop stitch core. Two of these PVC layers reinforce the sides. Deck and bottom seams are capped with two extra side wraps. This makes the SUP board lightweight, extremely durable, with the performance of a hardboard. Our CARBON shaft paddle is far superior to those made from aluminum or fibreglass. It weighs only 2 lbs.! It’s stronger, it floats, and it can be converted to a kayak paddle with an extra blade (sold separately). The 3-piece construction makes it portable and it’s adjustable from 68’’ to 84’’. The blade is tough nylon composite strengthened by a center rib to prevent warping under strain. Light and strong, our paddle is simply the best found in any iSUP package on the market. THURSO SURF boards feature 3 removable fins, allowing two different set-ups. All 3 fins installed gives the board the best stability and manoeuvrability – ideal for rough water. Using just the center fin gives the board the best tracking and lowest drag – great for straight speed and for flat water. The two fin setups offer the ability to paddle using different techniques and in various water conditions. The Quick-Lock fin installation is a breeze – slide in and clip, no tool needed. Top Engineering + Best Materials + Deluxe Accessories + Second-to-None Service = THURSO SURF. All of our products go through numerous analyses and tests before we finalize their material, shape, and design. We stand behind our products 100%. Buy with ABSOLUTE confidence – THURSO SURF Inflatable Stand Up Paddleboards have a two-year full warranty – if any manufacturer defect is found within 24 MONTHS of purchase, you can get it replaced or refunded. One of the greatest values in our add-on package is our CARBON shaft paddle. Weighing ONLY 2 lb / 900 g it floats and is much lighter than an aluminum or even fiberglass paddle. Try it and you’ll never want to go out on the water with another. With the new locking shaft mechanism, the SUP paddle can also be converted to a kayak paddle with the simple addition of a second blade (sold separately). With the help of a sweet set of rugged wheels, our THURSO SURF ROLLER backpack makes that hike to the water so much easier. The premium nylon outer shell can withstand sunlight, sea water and sand. It’s tough, like all of our products, and provides excellent protection to your board and accessories. The padded back, along with shoulder and waist straps distribute the weight evenly and offer the highest degree of comfort. The THURSO SURF manual pump does both INFLATE and DEFLATE, and is your best friend for getting your iSUP on to the water quickly or rolled up tightly into storage. A toggle switch makes both double and single action modes available for use at both low and high pressure. The recommended PSI is highlighted on the gauge so no worries about over or under inflating. We wanted to enhance the WATERWALKER with a design to show our love and respect for Mother Nature and to make it beautiful. With that in mind we gave it a signature wood grain on its top. The wood graphic was scanned from real woods, a combination of bamboo and rosewood. We’ve used the most advanced printing techniques to print this on a PVC layer. The graphic looks absolutely authentic (and beautiful!). With 3 removable fins the board can be set up in two ways. All 3 fins installed will give you the most stability (good for rough water). For speed and paddling a straight course, clip in only the center fin. No tools needed! Thanks to our Quick Lock technology, fin installation has never been so easy. Just slide in the fin and push the clip to lock it. Unlike most boards, the THURSO SURF WATERWALKER features an all-new 4-point D-ring and bungee cord system at the tail, giving you extra storage space. To help you in and out of the water the WATERWALKER now comes with three comfort grip grab handles placed at the front, rear and centre. Your board is always easy to manage within reach.